This treatise is, in general, a story of the evolution of two physical concepts…the constant transmission velocity of light and the varying motions of matter. It is also a fascinating story of the scientific confusion that evolved from trying to relate these two very different phenomena, which ultimately resulted in Einstein’s Special Theory of Relativity and other mathematical theories. Such confusion was then greatly enhanced and proliferated by Special Relativity, and it continues to this day. The first 17 chapters, which comprise Part I of this treatise, provide an in-depth discussion of certain relevant aspects of that which is now called “classical physics.” They also reveal and explain many previously unknown revelations with respect to classical physics. Three themes play a major role during this preliminary discussion. First, there was the development of the principles of mechanics (matter in motion), and the difficulties and paradoxes that were encountered in trying to reconcile the new and very different phenomena of electromagnetism to such mechanical principles. Secondly, there was the mythical substance of ether that theoretically permeated all of space, and which was invented in a misguided attempt to understand and explain the mysteries of electromagnetism. During the 19th and early 20th centuries, the theory of ether distorted everything, and its mathematical consequences created many very serious problems and paradoxes for physics. Thirdly, and possibly most importantly, there were the beginnings of the continuing myth that mathematics is invincible in physics…and that from a mathematician’s imagination (i.e. his algebraic formulas and geometrical illustrations) all of the physical mysteries of nature can be discovered, understood and confirmed. For example, imaginative 19th century theories and mathematical formulas absolutely confirmed that the hypothetical “ether” (and its theoretical consequences) actually physically existed. Physicists, mathematicians and the scientific community as a whole ardently believed in and universally applied the “ether theory” to their experiments and to their other theories for almost a century. However, it is now known that “ether” was a complete fiction and that it does not exist. Nevertheless, its vestiges linger on and continue to distort much of physics. “Both the special theory of relativity and the general theory of relativity are creations of our present century. One cannot understand these theories fully without some notion of what had gone on before” (Rohrlich, p. 35). The same is true with respect to quantum physics and other mathematical theories. Secondly, because many of the past theories, concepts, assumptions, interpretations, and experiments which form the foundations, premises and confirmations for Special Relativity were also ad hoc, contrived, mistaken and/or empirically invalid. Thirdly, because such 17 introductory chapters contain numerous empirical explanations for theoretical paradoxes and physical mysteries that have never been revealed or explained before. Finally, because it is impossible to fully understand Part II of this treatise without reading and understanding Part I. Part II of this treatise presents an insightful scrutiny, analysis, and discussion of the concepts of Albert Einstein’s 1905 Special Theory of Relativity, and its many mathematical consequences. This discussion discloses and demonstrates in great detail that Einstein’s Special Theory (like the “ether theory”) was based on numerous false premises and faulty assumptions. It also explains why such Special Theory and its mathematical consequences are almost completely physically invalid and empirically meaningless. 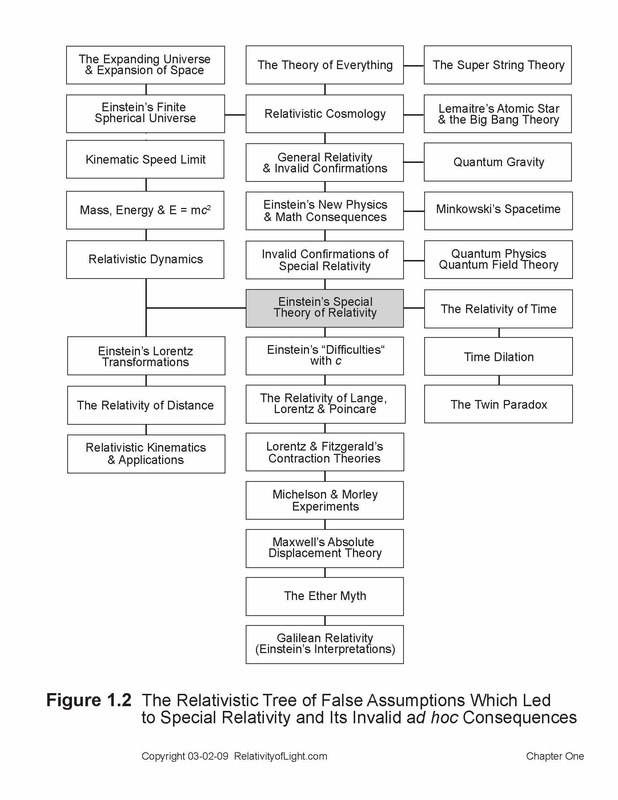 This second part also demonstrates that, in fact, there are no experimental confirmations of Special Relativity and its consequences, and that other mathematical theories which purport to confirm Special Relativity and its mathematical consequences are themselves either highly dubious, unconfirmed or invalid. Thus, ultimately and unfortunately, this treatise is also a tale of the misguided triumph of ad hoc and artificial mathematical theories over logic and commonsense. of scientific agendas over objectivity. and of scientific authority and blind acceptance over skepticism and scrutiny. “A paradox must not be confused with a contradiction; it is a seeming [apparent] contradiction, or a statement which differs from what we would normally expect, but which, on closer examination turns out to be true. If a theory predicts paradoxical results, this is a stimulus to further thought, and calls for clarification and explanation, while if a theory predicts a contradiction this calls for a revision of the theory. Thus one might say that the role of the paradox in science is concerned with teaching and understanding while the role of the contradiction lies in the advancement of science itself” (Gill, p. 13). On the other hand, if the explanation of the paradox results in the revision of a theory or a myth, then science is also advanced. “While it is now axiomatic that physical theories do not need to conform to ‘commonsense’ it is still a fact that a disagreement with ‘commonsense’ or with our intuitive ideas of the world, makes a prima facie case for taking a closer and more critical look at a theory. One reason for this is that an important element in scientific commonsense is logic, and a logical contradiction in a theory must sooner or later manifest itself; in other words, a conflict with commonsense can either be a symptom of a serious defect in a theory, or merely our reaction to the unfamiliar. The first possibility must not be ignored in our overwhelming enthusiasm for the strange and paradoxical” (Ibid, pp. 13 – 14). In the author’s opinion, if the explanation of a physical paradox or a physical phenomenon defies logic or commonsense, then such explanation is most likely incorrect. We shall discover, during our discussions in this treatise, that many commonly accepted theories, physical phenomena, and paradoxes are (or are based upon) false assumptions, illusions, fantasies, and myths. In the chapters to follow, we will attempt to explain many of these baffling paradoxes, illusions and myths and assist the reader in distinguishing fact from fantasy and reality from illusion. A. What is Einstein’s Special Theory of Relativity in a nutshell? In his book entitled Light, Professor Sobel describes in very simple and straightforward terms exactly what Einstein was attempting to achieve with is 1905 Special Theory of Relativity. Einstein began his Special Theory with the fundamental thesis that the magnitudes or quantities of some physical phenomena can vary depending upon whether they are stationary or moving when they are observed or measured (Sobel, p. 203). Einstein cited three theoretical examples of this fundamental thesis, none of which is empirically valid. Einstein’s first example was that “a fixed electric charge will set up an electric field, but a moving electric charge [a current] will set up both an electric and a magnetic field” (Sobel, p. 203). The simple reason for this new quantity (a magnetic field) is that “an electric current…acts as a magnet” (Ibid). Therefore, contrary to Einstein’s assertions, Faraday’s law for the induction of an electric current by reason of the relative motion of a magnet passing through a wire coil does not depend upon the relative state of motion of the observer who is measuring this process. Einstein’s second example of his fundamental thesis concerned Maxwell’s law that a light ray always transmits at the constant velocity of c (300,000 km/s) in a vacuum. Einstein claimed that a ray of light did have a constant velocity of c relative to a stationary railway carriage, but relative to a carriage that was moving at v linearly down a railway track the transmission velocity of the light ray changed from c to c – v (Einstein, Relativity, pp. 22 – 23). In other words, Einstein claimed that Maxwell’s physical law of the constant transmission velocity of light changed solely because of such relative motion. These critical false premises for Einstein’s entire Special Theory are discussed in detail in the Preamble to this treatise. Einstein’s third example of his fundamental thesis concerned the famous paradoxical null results of the 1887 Michelson and Morley (M & M) experiment. Einstein claimed that the “missing time interval” of a propagating light ray in such experiment was fully explained if we assume that the longitudinal arm in Michelson’s experiment contracted in length in the direction of the Earth’s solar orbital motion (velocity) around the Sun (Einstein, Relativity, pp. 58 – 60). Einstein’s contraction theory supposedly explained the paradox and saved Maxwell’s law concerning the constant transmission velocity of light at c in a vacuum (Chapter 15). On the contrary, we will demonstrate the three real reasons for the M & M paradox, none of which involve any contraction of matter (Chapters 9 – 12). Einstein’s second fundamental thesis was that “the laws of physics cannot depend on who is observing them” (Sobel, p. 203). This simplistic thesis is so obviously correct that it requires no further proof or discussion. Einstein’s third fundamental thesis was that the laws of physics “must deal with quantities that do not vary with [velocity]—or the laws must relate quantities that vary with [velocity] in the same way” (Ibid). “Any quantity that…does not vary with [velocity] is called an invariant” (Ibid). “Einstein’s new [idea was] to assert that the speed of electromagnetic waves, the speed of light, is one of the invariants” (Sobel, pp. 203 – 204). This simple goal of Einstein’s Special Theory sounds benign enough. But there were three major and insurmountable problems: 1) Einstein’s Special Theory and his simple goal were totally unnecessary, because the transmission velocity of light at c in the medium of a vacuum was already constant and it does not vary (see the Preamble and Chapters 21 & 22); 2) the “relative velocity” of a propagating light ray at c ± v, which naturally varies with respect to bodies moving linearly at v relative to the light ray, and which Einstein was attempting to make an invariant, is neither a law of physics nor a law of nature (see the Preamble and Chapters 21 & 22); and 3) in order to attempt to achieve his simple goal, Einstein needed to change or distort ad hoc most of the other laws of physics (see Chapters 20G, and 24 through 33). As can readily been seen from the above discussion, Einstein’s Special Theory was based upon numerous false premises and ad hoc assumptions, and for this reason alone it is empirically invalid and physically meaningless (Memo 1.1). There are also many other reasons for such conclusions, and they will be demonstrated and explained throughout this treatise. As a mathematical theory, which Special Relativity primarily is, it makes some mathematical sense and is somewhat mathematically consistent. However, as a physical theory, which Special Relativity is purported to be, it makes no empirical sense whatsoever, it is completely inconsistent and empirically invalid, and it contradicts observations, experiments, logic and commonsense. For all of the reasons set forth above and throughout this treatise, Special Relativity can best be described in a nutshell as an artificial mathematical theory which was invented to solve several non-existent problems; but in the process it created a multitude of real problems for physics and science as a whole (Figure 1.2). B. What are the differences between empirical theories and mathematical theories? At this early point, let us discuss the general subjects of empirical theories and mathematical theories for a few moments. A physical theory may either be empirically claimed to be true (such as Newton’s theory of gravity) or mathematically claimed to be true (such as Einstein’s Special Theory of Relativity). In order for any claimed physical theory to be taken seriously, it must make at least one clear new prediction that is different than the predictions of previous theories (Smolin, p. xiii). If it cannot predict, such a new theory is automatically considered to be “highly questionable” (Rohrlich, p. 18). In addition, such prediction must be “testable” (Ibid). By testable, we mean that such prediction must be both falsifiable (vulnerable to being shown to be invalid or false) and confirmable (capable of being demonstrated by meaningful experiments to be consistently correct) (Smolin, p. xiii). “[T]he falsification of a theory is, in many ways, even more significant than its verification” (Bohm, p. 123). If a new theory or prediction is not testable it must be considered to be meaningless. If a physical theory is consistently supported by meaningful empirical data, this may be considered to be an “experimental confirmation” of such theory. If it is consistently supported by enough observational and/or experimental confirmation over a sufficiently wide range of experience, such physical theory may ultimately be accepted as valid by the scientific community. If it is accepted for a long enough time by enough of the scientific community, it may eventually be considered to be an established law of nature (Rohrlich, pp. 17 – 19, 111 – 114). “No theory can ever be proven to be correct in the same sense as a mathematical theorem can be proven. The best that one can expect is to be convinced of its correctness with overwhelming high probability” (Ibid, p. 17). How can one tell whether a claimed theory or law of physics is false? Must one demonstrate that every claimed experimental confirmation of such theory or law is invalid? The answer is No. The skeptic is not held to this almost impossible burden. It is enough if the challenger conclusively demonstrates that such claimed theory or law is contradicted in any example of its claimed application, otherwise known as its “domain of validity” (Rohrlich, p. 18). No matter how long a physical theory or law has been accepted or established, no matter upon whose authority it is considered to be valid (i.e. Aristotle or Einstein), no matter how mathematically “beautiful” it is, or how many supposed experimental confirmations it may have to its credit, if a physical theory or law is convincingly contradicted or demonstrated to be invalid in only one situation or with respect to only one observer, it must either be revised or completely discarded. This falsification or disconfirmation process has happened many times during the history of science. Most of Aristotle’s once established laws have been conclusively contradicted by scientists such as Galileo, Kepler, Newton and Maxwell, and they have been discarded. Once accepted theories, such as “caloric” and “phlogiston,” have long ago been proven to be completely wrong. Even the once established and entrenched theory of “ether” was demonstrated over a century ago to be merely a myth and it has been totally rejected. “There is no guarantee that one of our presently accepted theories may not also share the same fate” (Rohrlich, p. 19). “Every physical theory must begin and end in observation…The final test necessarily is comparison with observations; no theory can survive which is not able successfully to stand this test. This truth has sometimes been lost sight of” (De Sitter, 1932, p. 6). Indeed, these lofty goals have too often been completely ignored. During the 17th and 18th centuries it was realized that hypotheses or theories might assist in the discovery of new phenomena, and, in turn, existing phenomena became useful tools for the creation of new theories. Gradually, however, during the early 19th century, there developed a permissiveness or laxness in the framing of hypotheses, and by the end of the century imagination, conjecture, speculation and rationalization was often substituted for experience (Dingle, 1972, pp. 26, 27). What made this unscientific process possible was the unlimited extension of Galileo’s famous statement, “the book of nature is written in the mathematical language.” Galileo was only referring to his mathematical description of physical observations related to his experiments in mechanics, not to mathematical axioms and formulas as an end in themselves and as a substitute for experiments and experience (Ibid, p. 30). Nevertheless, this latter philosophy is what triumphed around the end of the 19th century…first with Fitzgerald, Lorentz and Poincaré and then culminating with the mathematical theories of Einstein between 1905 and 1917. “their implications are developed into extended systems of thought which necessarily follow from the axioms but may or may not correspond to what can be observed in nature” (Ibid, p. 29). It is now often assumed that “a physical theory is necessarily sound if its mathematics is impeccable: the question whether there is anything in nature corresponding to that impeccable mathematics is not regarded as a question; it is taken for granted” (Ibid, p. 30). Realistically, a mathematical language “is just as capable of expressing false ideas as true ones. The fact, therefore, that something can be expressed with rigorous mathematical exactitude tells you nothing at all about its truth, i.e. about its relation to nature, or to what we can experience” (Dingle, 1972, p. 30). “[W]ithout in the least rejecting…a mathematical solution of the problem, we can also say…that it is not a possible physical solution. Nevertheless, in modern physics [a mathematical solution] is universally assumed to be [a physical solution], on the sole ground of its mathematical validity” (Ibid, p. 33). “The fact is…that mathematical truths are far more general than physical truths: that is to say, the symbols that compose a mathematical expression may, with equal mathematical correctness, correspond both to that which is observable and that which is purely imaginary or even unimaginable. If, therefore, we start with a mathematical expression, and infer that there must be something in nature corresponding to it, we do in principle just what the pre-scientific philosophers did when they assumed that nature must obey their axioms” (Ibid, pp. 30 – 31). All of these problems and concerns expressed by Professor Dingle in vis. 1972 book, Science at the Crossroads, continue to be real problems and concerns during the first decade of the twenty-first century. They relate specifically to all of Einstein’s mathematical theories of relativity, which he invented during the period 1905 – 1917. They also relate to all other mathematical theories that are in whole or in part predicated upon Einstein’s relativistic theories, such as quantum mechanics, quantum field theories, particle physics and superstring theory, to name just a few. The question is thus presented: to what extent are any of these mathematical theories physically meaningful? Typically, most current mathematical physical theories, whenever physical phenomena (imagined by a theorist) can be construed to be mathematically true, such hypothetical physical phenomena will thereafter be “conjectured” to physically exist. At this point, a process is often begun by others to “confirm” such hypothetical physical phenomena by any plausible interpretation of available experimental data. This arbitrary and unscientific process, of course, results in countless invalid and self-fulfilling prophecies. Once established, these pure mathematical theories, their mathematical consequences, and the meaningless mathematical ‘physical’ phenomena that they describe, become the foundations for new mathematical theories, more imagined mathematical physical phenomena, and further ad hoc predictions and “confirmations.” Thus, this pseudo-scientific cycle endlessly repeats itself. Does such an artificial process serve physics, science in general, reality or humanity? During the remainder of this treatise we will analyze and discuss these mathematical theories and attempt to determine the answer to this question. C. Why should anyone care about Special Relativity and other mathematical theories? The main confusion about Special Relativity (and about all of Einstein’s relativistic theories for that matter) stems from the fact that Einstein’s Special Theory is a dichotomy. Einstein conceived and wrote it as a mathematical theory, with coordinates, reference frames and algebraic equations. However, he and his followers have generally interpreted it, promoted it, and attempted to confirm it as an empirical theory that is literally and physically true (which it is not). For these reasons, this treatise will primarily analyze and critique Einstein’s Special Theory (and other mathematical theories) from an empirical point of view. One might ask: why should anyone in the twenty-first century care about Special Relativity or its related mathematical theories? There are countless reasons why we should care. Because every student of college level physics (and above) is required to study, if not understand, Einstein’s obscure concepts of relativity and their related mathematical theories. Because libraries and bookstores worldwide have shelves upon shelves of books devoted to such relativistic subjects. Because uncountable radio broadcasts, television programs and websites refer to Einstein’s artificial relativistic theories as gospel. A quick search of the Internet at the time of this writing shows over 280,000 sites that specifically relate to Special Relativity and over 435,000 sites that specifically relate to General Relativity. That alone totals over 700,000 websites. Each year many complicated and expensive experiments are conducted to study, apply, validate or extend Einstein’s theories of relativity and their theoretical consequences, including those involving space launches, satellites, and particle physics. Scientific and other periodicals worldwide annually include more than a modest collection of articles related to Special Relativity, other relativistic theories, and their progeny. In short, a great deal of scientific effort and monetary resources are expended (and possibly wasted) each year on attempts to study, understand, validate, apply, and/or extend the concepts of Special Relativity, and its sister theories. Physicists factor Einstein’s relativistic concepts into their theories as well as their experiments and other practical work. Relativistic inferences and interpretations affect, contaminate and distort the conclusions drawn from high-energy particle physics experiments, quantum mechanics, rocket science, astronomy, and other scientific disciplines. Much of cosmology is founded on Einstein’s dubious theories of relativity, including the Big Bang and the expanding universe. The meaningless and unsolvable ‘twin paradox’ derived from Special Relativity is the subject of seemingly endless debates. The ubiquitous superstring theory is largely based on Einstein’s theories of relativity, and over 1,000 of our brightest scientists currently work on it, often because string theory is now the only real ticket to a university professorship (Smolin, p. xxii). This is only a partial list of the negative impacts of Special Relativity, and its related relativistic mathematical theories. Do we as a society want to know the realities of matter, motion, time, space, light, atoms, and the cosmos in which we live? Or are we content to be entertained and mystified by false or dubious concepts, myths and science fiction (Memo 1.1)? Can we afford not to know the truth about the physical and natural laws of the universe? “The public response to the theory of special relativity and its consequences was, and is, one of incredulity among both amateurs and professionals” (Rigden, p. 102). Professor David Bohm, himself a relativist, also points out that: “…it must not be supposed that relativity is an iron-clad certainty, which should not be questioned…it is, therefore necessary…to apply the theory in a tentative manner, being alert and ready to criticize it, and if necessary to replace it…” (Bohm, p. 109). Most of the scientific manuscripts that are skeptical or critical of Special Relativity concentrate on the mathematical consequences and implications of the theory, or on its mathematical and technical mistakes. The Relativity of Light, on the other hand, deals primarily with the foundations of Einstein’s Special Theory: its false premises and meaningless assumptions, its invalid postulates, its strained logic, rationalizations and analogies, its conjectures, its absolute and ad hoc concepts, and its false, mistaken or irrelevant so-called confirmations. If these fundamental criteria are not correct, then it follows that neither are the assertions of the Special Theory, its consequences, its implications, and its theoretical progeny. Special Relativity, like many other generally invalid theories, has certain minor correct concepts associated with it. We will attempt to point out these minor correct concepts as we go along. There appears to be a strong reluctance on the part of the general public to even consider the subject of Special Relativity. Many people merely assume that the theory (whatever it is) must be correct, because everyone else seems to believe it is, and because the great Einstein created it. For others, the very words, ‘Einstein’ and ‘Relativity,’ send shudders of consternation up and down their spines. Most potential readers assume that Einstein’s relativistic concepts must be very difficult to comprehend, and that his complicated mathematical equations need to be understood. However, neither of these assumptions is correct. Once the reader realizes that Einstein and all of his followers over the decades have made many false assumptions, critical mistakes, and meaningless conclusions, then the subject becomes less intimidating and more of a fascinating mystery: how could all of these great scholars have been so mistaken for so long? If the reader is the slightest bit skeptical or inquisitive about Special Relativity and the questions of its creation, validity, application, and confirmation, then you are invited to join the author in a fascinating step-by-step examination of the theory, its evolution, and the many unexpected issues, answers, and revelations along the way. Any intelligent and motivated reader, even without any background in physics, can understand this treatise. It is written in plain English with only a few simple (and fully explained) mathematical equations where absolutely necessary. Because this treatise is intended to be read and understood by the lay reader (as well as the scientist), it is light on mathematics and heavy on logical and empirical explanations. All necessary terms and concepts are included, and they are clearly defined and fully explained. There are well over 200 illustrations and charts to assist the reader toward a full understanding of the subject matter. It is suggested that the footnotes as well as the text should be read slowly and thoughtfully, even by Ph.D.’s. All chapters should be read in sequential order, even if the reader thinks he or she already knows the subject matter. The Relativity of Light has been a monumental project for the author and his small staff during the last eight years, and it undoubtedly contains some mistakes, inaccuracies and omissions. For this reason, the author solicits constructive criticism, critiques, and insights from the readers. Especially welcome are suggested changes, additions, and their authoritative sources (if any). The main goals of the treatise are to expose and discuss the flaws in existing theories, experiments and interpretations, while always striving for truth, reality and better answers. The author and his staff can be contacted by email: contact@relativityoflight.com. The 42 chapters which comprise this treatise (plus their bibliography) will be added to this website in sequential order as they are edited and rewritten during the calendar year 2009. Please see the Table of Contents for a complete list of chapter titles. An index and certain supplements will be added upon completion. Note: Most of the author’s bibliography of sources and much of the text of his source citations and quotations can be found online, in a good general library or physics library, or for purchase on Amazon.com. However, it is suggested that the serious reader should in any event invest a few dollars to purchase the following indispensable and ubiquitous paperback books which are available online or in any large book store: 1) The Principle of Relativity, 1952 Edition, Dover Publications, and 2) Relativity: The Special and the General Theory, by Albert Einstein, 1961 Edition, Three Rivers Press.